An article on the activities of Mr. Kumano was featured as a cover story of “Biglife21”, the information magazine for managers of small and medium-sized enterprises. 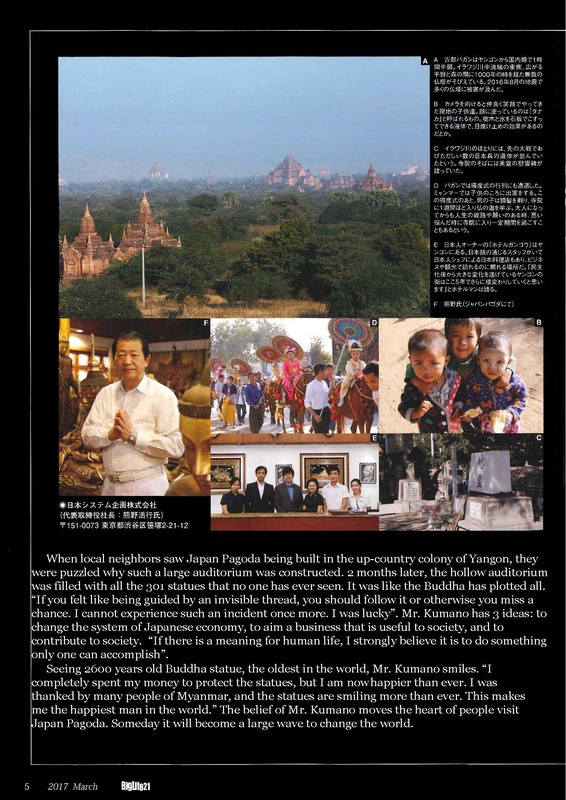 The chairperson Mr. Kumano has been contributing the society of Myanmar since 2002, and the article mainly shows his episodes of protection and donation of historically valuable 301 antient Buddha statues. All the interviews and shootings are done in Myanmar. What comes to your mind when you hear Myanmar? Many people imagine of Ms. Suu Kyi, the democratization of shaking society, the last great war, or perhaps the novel “The Burmese Harp”. However, I suppose there are not so many people know the story of a very famous Japanese individual in Myanmar. His relationship with Myanmar started back in the turbulent period before the democratization when he protected historic Buddha statues up to 301 from raging political situation. “The time of self-interest and money-happy has ended. The world must change its mindset to social contribution that benefits society more than to benefit oneself”, he says in a strong voice. 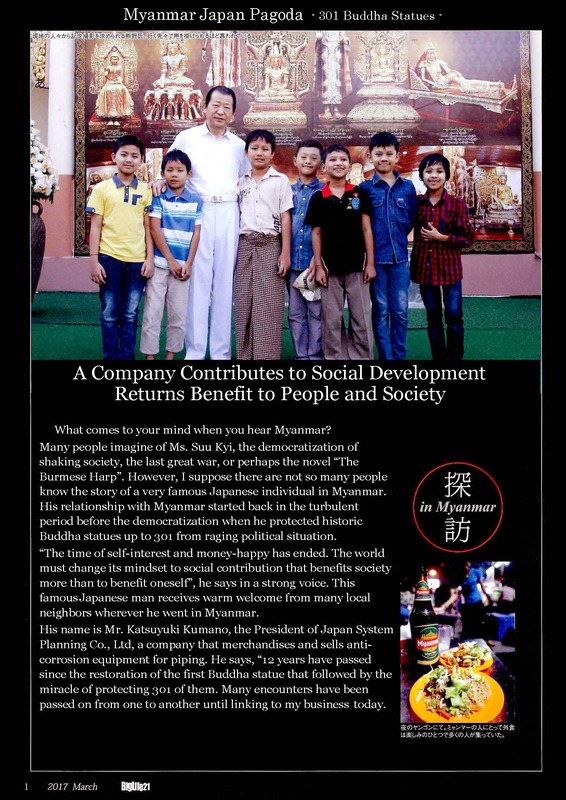 This famous Japanese man receives warm welcome from many local neighbors wherever he went in Myanmar. His name is Mr. Katsuyuki Kumano, the President of Japan System Planning Co., Ltd, a company that merchandises and sells anti-corrosion equipment for piping. He says, “12 years have passed since the restoration of the first Buddha statue that followed by the miracle of protecting 301 of them. Many encounters have been passed on from one to another until linking to my business today. 5 years have passed since the privatization, and one year since the democratization. Foreign capitals were introduced into the country under the economic openness, and many Japanese companies entered as one of it. Not so few Japanese communities were made in local areas. There are events focusing on Japanese culture in Yangon, and the number of hotels supporting Japanese people is increasing. Myanmar has become more familiar to Japan. Myanmar, the energetic enthusiastic last frontier of South-East Asia. We accompanied with Mr. Kumano and went out to the local. Aung Zabu Tawya Temple stands on Hmawbi Township in Yangon, Republic of the Union of Myanmar. On entering the temple, the solemn golden Buddha statues captivate anyone who steps into. It counts to 301 including the oldest remaining. When it comes to Sunday, 50 thousand people visit here from all over Myanmar to say prayers. 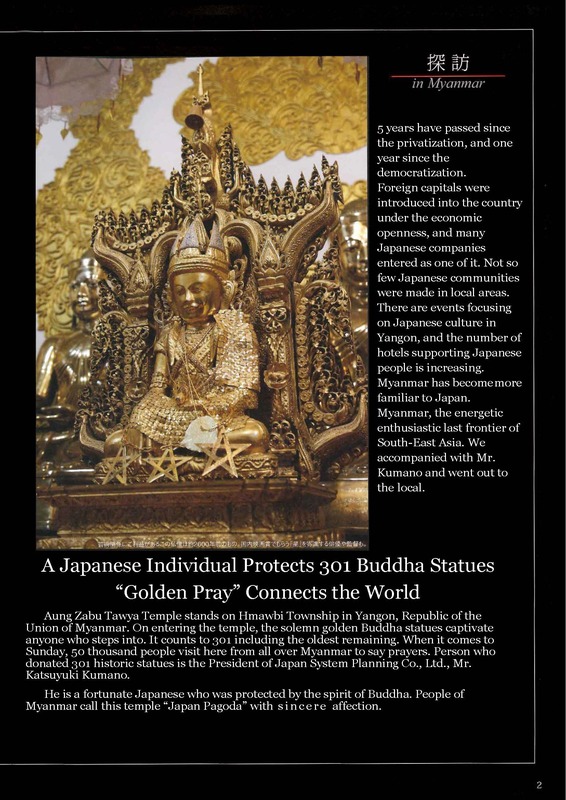 Person who donated 301 historic statues is the President of Japan System Planning Co., Ltd., Mr. Katsuyuki Kumano. He is a fortunate Japanese who was protected by the spirit of Buddha. People of Myanmar call this temple “Myanmar Japan Pagoda” with sincere affection. Mr. Kumano heard that distressed monks were inevitably trying to let go of the treasured Buddha statues, so he bought all of them at his own expense, loaded them into a truck and carried them into his house. We questioned him the belief that drove him to behave such. “I thought it was something no one can do but me” he answered with a calm face. It was 2003 when he and Myanmar were linked by fate. At that time, his purpose was just sightseeing. However, a year after next, Mr. Kumano lost his way in ancient city, Bagan, by a mere accident and entered an old and decayed templet to find help. In there, he was face to face with a fierce looking Buddha statue. He was surprised and ran immediately. Even he flew back to Japan, the statue chased him into his dream night after night. One day he noticed it was not just terrifying but trying to tell something. He flew back to Myanmar and offered the repair of the decayed temple. “Looking back now, I believe I was attracted by something”. Coincidentally, it was the oldest temple in Myanmar with a long history as old as the age of Pyu. The hands of fate have begun to spin. The monks spoke to Mr. Kumano “You must have been guarded by the blessing of Buddha”. Mr. Kumano says, “Like they say, I think I was protected by a force. Instead of feeling scared, it was more like I must do it”. Myanmar Japan Pagoda has been under construction since 2005. At the same time, Mr. Kumano started protecting the Buddha statues. The construction completed 2 months before his donation by chance. 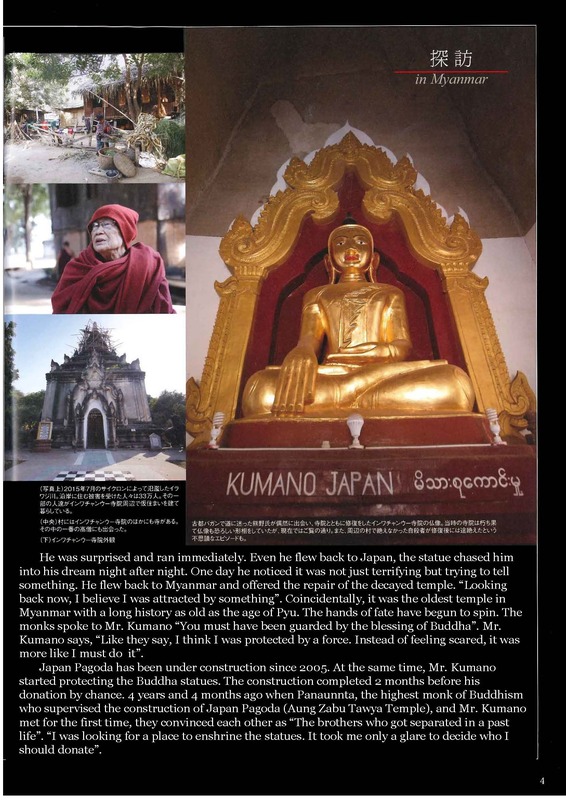 4 years and 4 months ago when Panaunnta, the highest monk of Buddhism who supervised the construction of Myanmar Japan Pagoda (Aung Zabu Tawya Temple), and Mr. Kumano met for the first time, they convinced each other as “The brothers who got separated in a past life”. “I was looking for a place to enshrine the statues. It took me only a glare to decide who I should donate”. When local neighbors saw Myanmar Japan Pagoda being built in the up-country colony of Yangon, they were puzzled why such a large auditorium was constructed. 2 months later, the hollow auditorium was filled with all the 301 statues that no one has ever seen. It was like the Buddha has plotted all. “If you felt like being guided by an invisible thread, you should follow it or otherwise you miss a chance. I cannot experience such an incident once more. I was lucky”. Mr. Kumano has 3 ideas: to change the system of Japanese economy, to aim a business that is useful to society, and to contribute to society. “If there is a meaning for human life, I strongly believe it is to do something only one can accomplish”. Seeing 2600 years old Buddha statue, the oldest in the world, Mr. Kumano smiles. “I completely spent my money to protect the statues, but I am now happier than ever. I was thanked by many people of Myanmar, and the statues are smiling more than ever. 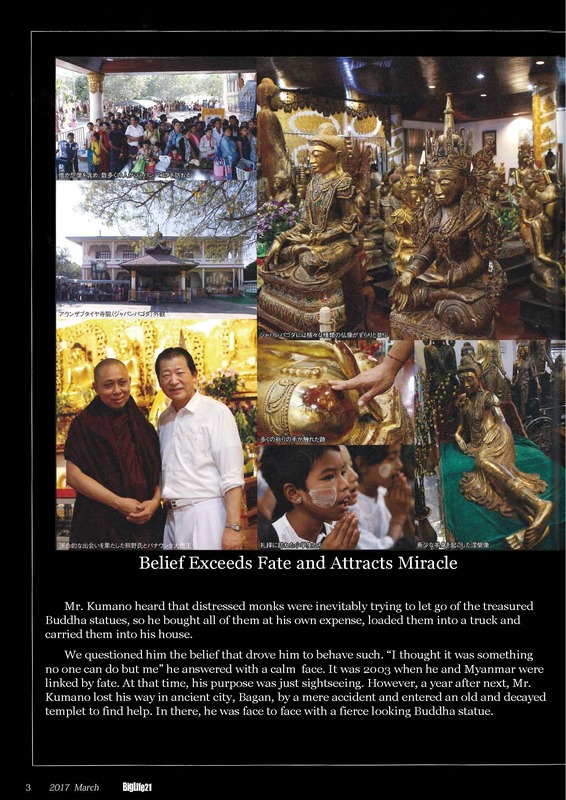 This makes me the happiest man in the world.” The belief of Mr. Kumano moves the heart of people visit Myanmar Japan Pagoda. Someday it will become a large wave to change the world.